Hey y’all! We are now officially into the first week of Fall, and oh what a wonderful week it’s been so far. I know for some of you, Fall doesn’t mean to much in terms of weather. But for me, this time is one of the major perks of living in the good ol’ Midwest. The humidity is gone, the air is cool and crisp, and it’s officially soup season for many months to come. I grew up knowing that in the cool season, a big pot steaming on the stove meant some good food was coming… and it’s one of my favorite things. I know it seems like my recipes have contained a lot of corn lately. But you see, living in the heart of the Midwest also means that corn is kind of a way of life. We live out in the country surrounded by cornfields. My hometown even has an annual festival dedicated to corn! It’s just the way she goes in these parts. 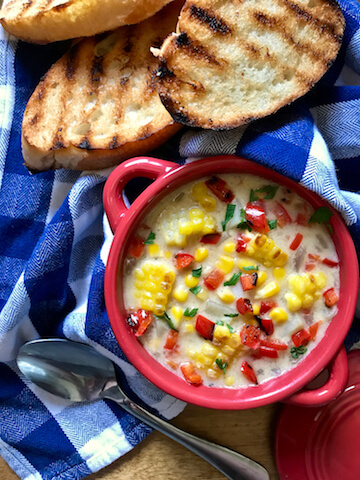 And of course, it’s delicious… so naturally, I have a killer corn chowder recipe, and I hope it will be your family’s new favorite thing! I’ve been making this recipe for quite a long time. 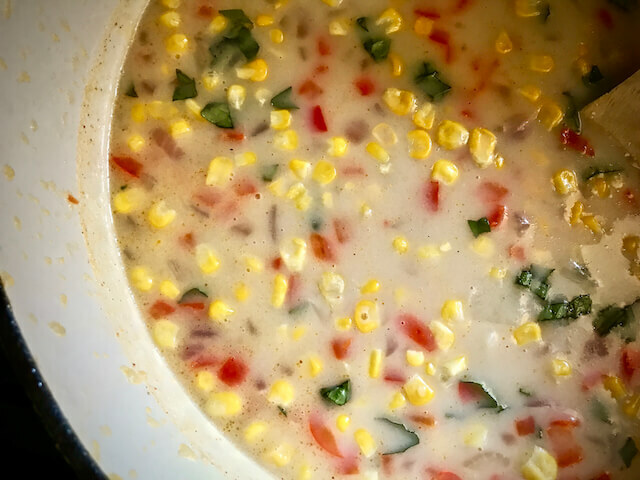 Over the years, I’ve been tweaking it just enough that I finally am able to say that this is the best corn chowder in the entire world. Well, our lil’ family thinks so anyway. 😉 It’s just creamy and rich enough to be filling and delicious, without being heavy on calories. The flavor is out of this world! The basil really is necessary, so please don’t skimp out on it, okay? I will say that fresh herbs are best. 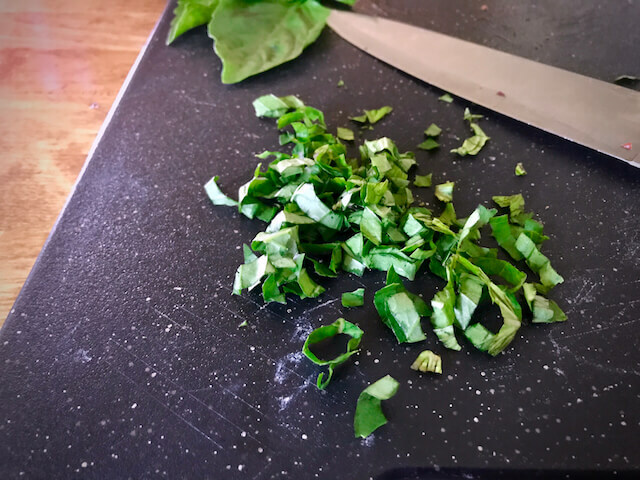 But I cooked this recipe a few times, and tried it using both fresh and dried basil. It’s just as tasty either way. 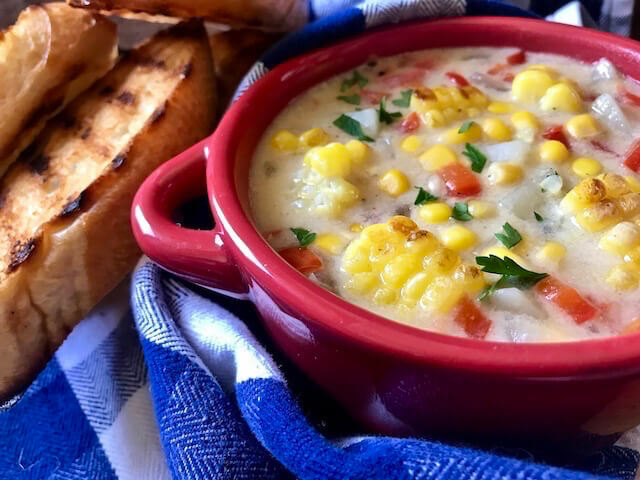 And lastly, this Corn Chowder is one of those recipes that tastes even better out of the fridge the next day, after all those subtle flavors have a chance to relax and mingle… this makes it perfect for meal prep, folks! 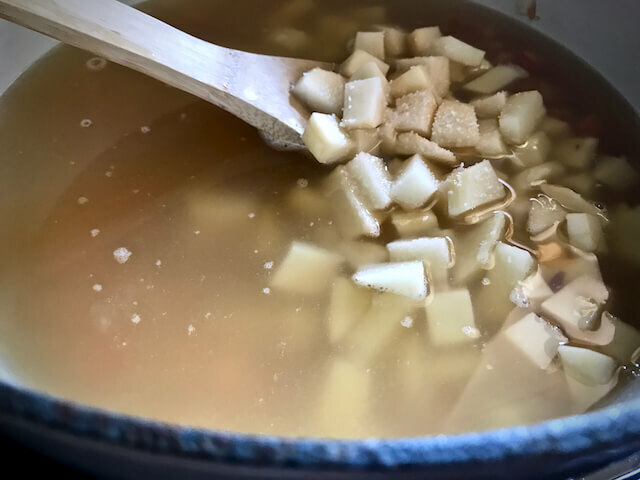 This yummy chowder needs nothing but the ingredients that I’ve listed, but it’s actually a pretty flexible recipe. Eric always adds a teaspoon or two of Frank’s Red Hot sauce. I don’t love it this way, but when you’re cravin’ that little kick, it’s perfect! Many times I prefer to load it up a bit, and turn it from a simple soup into more of a meal in a bowl. I like to crisp up some bacon, and add it on top with a little cheese. Because I mean, bacon and cheese makes everything better, right? But for reals y’all, it doesn’t need a thing… except for maybe some delicious grilled bread, some toasty croutons, or a few crushed crackers to soak up some of that soup-ness. 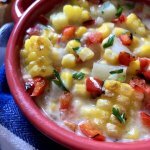 You can use fresh, frozen, or canned corn- It all works. But If I were you I’d go for frozen or fresh, because it’s just better. I’ve got nothin’ against canned corn. (I’ve got a few of them in my pantry right now.) 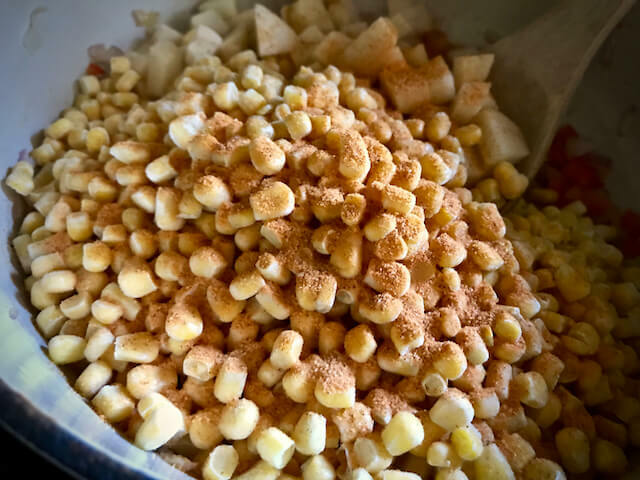 But since the corn is the star of the show here, we want that crunchy texture, and fresh and frozen corn simply work better for that purpose. Now here we go friends- let’s get in the kitchen, and see how it’s done! 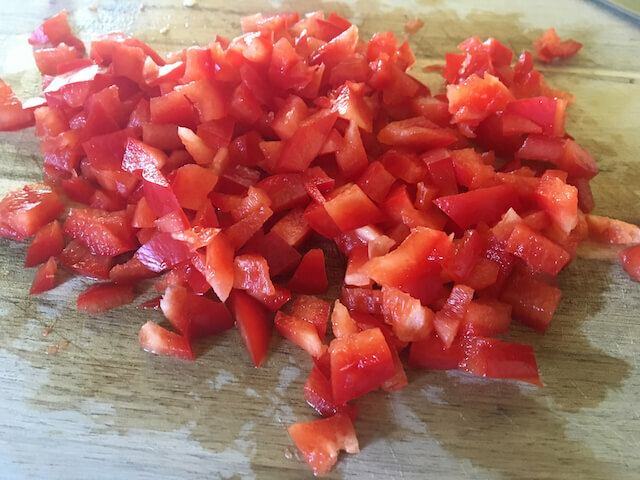 Start it up by chopping up a big delicious red bell pepper. 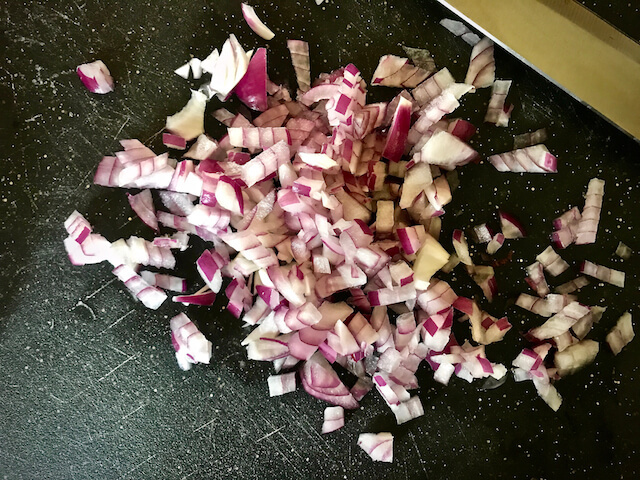 Next, dice up a red onion. Now, for the potato. Small chunks will do here. I’m a rebel, and don’t much care to make them all the same size. But yeah, try to make them kinda the same-sized small-ish chunks, to ensure they all cook up properly. Now in a dutch oven or a large stock pot, add a little olive oil and let it heat up for just a minute. 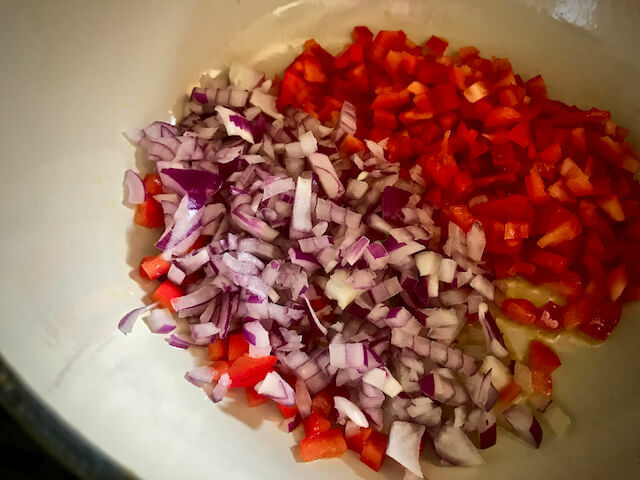 Then toss in your diced red peppers and onions. Sauté them over medium heat for a few minutes until they are soft, and just a lil’ caramelized. Now add the chopped potatoes, corn, pepper, and some good ol’ Lawry’s Seasoned Salt. Okay. Now sprinkle some flour over all these goodies, just a lil bit at a time, while stirring. Continue stirring it up real good for a few minutes to make sure it coats everything real well, and to ensure the raw flour taste cooks off. Stir everything up real well. 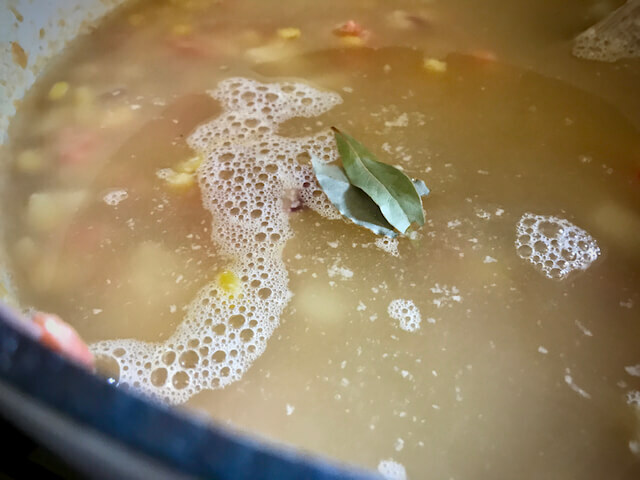 Add a bay leaf, and reduce the heat to a simmer. Let it hang out on the stove for 20-25 minutes, until the potatoes are cooked through. and I don’t always have the fresh stuff on hand to work with- dried basil will work just as well. Now, stir in half and half, and let it continue to simmer for a few more minutes. 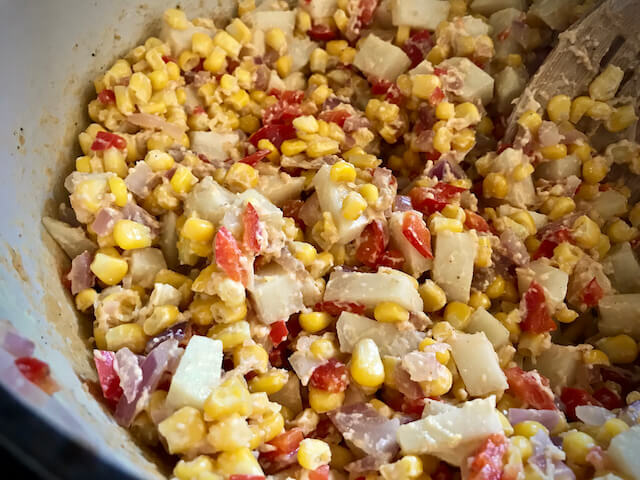 …and now you’ve got yourself some of the best dang Skinny-ish Corn Chowder ever!! Although this soup is absolutely perfect on its own, make it a little more of a meal by adding some crispy bacon and cheese on top, and you’ll be even more in love with it! 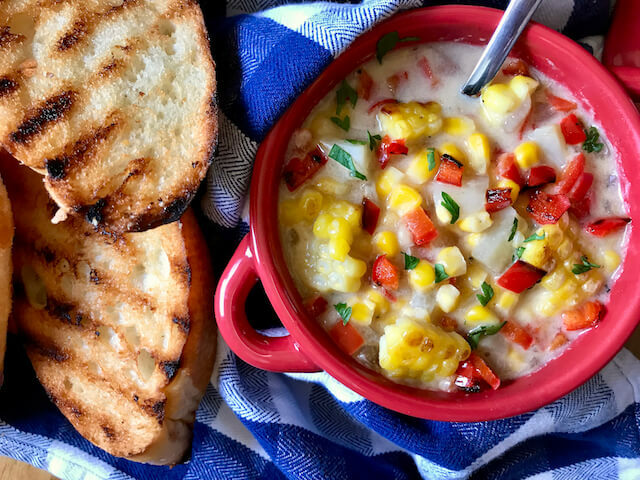 The tastiest creamy corn chowder with red peppers, potatoes, onions, corn, and fresh basil. 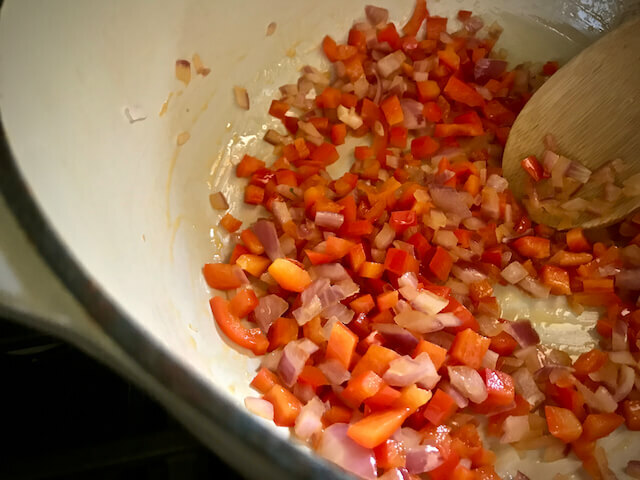 In a dutch oven or a large heavy bottom stock pot over medium heat add olive oil and then the diced red peppers and onion. Sauté until onions are soft and slightly caramelized. When the onions are soft add potatoes, corn, seasoned salt, and pepper. Mix well. 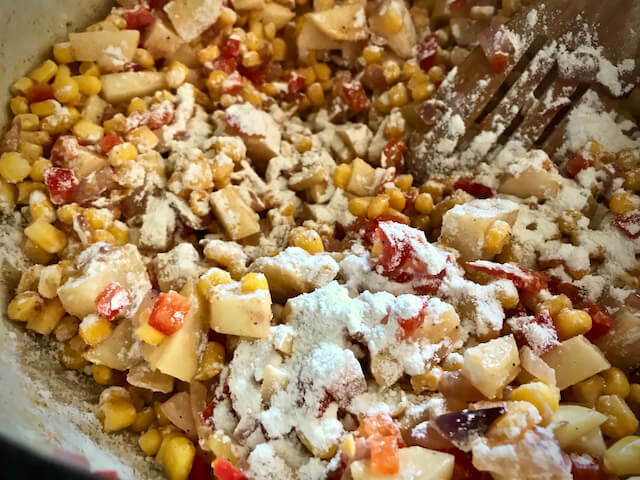 Slowly sprinkle the flour over the mixture of vegetables while stirring. Continue to cook and stir for a few minutes. Add vegetable broth. 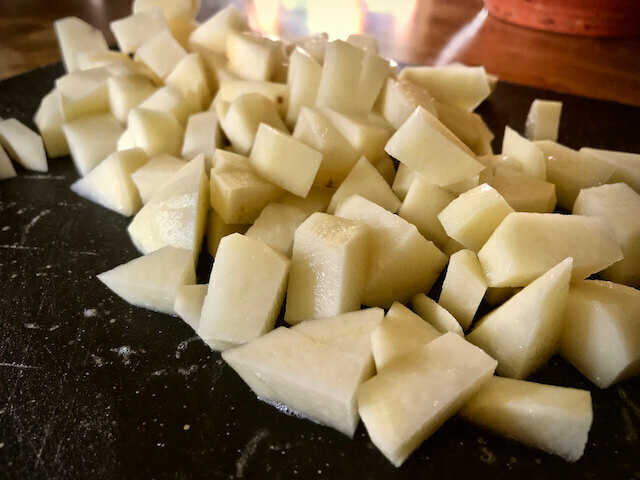 Reduce the heat to low and simmer for 20-25 minutes or until the potatoes are cooked. Stir in half and half and fresh (or dried basil). Continue to cook for just a few more minutes. Salt & pepper to taste. Serve warm. Just so you know, the bay leaf isn’t listed in the ingredients. Also, my soup didn’t thicken up. Is it supposed to? The taste was great. I love your recipes! Do you think you can use coconut milk as a non-dairy option? Looking for a vegan option. I haven’t worked with coconut milk really because I’m not a big fan of the taste of coconuts, but unsweetened plain almond milk should work perfectly. Girl, this is absolutely delicious!!!!! It’s so good that I find it hard to believe it only has 5 points. I can’t wait to try more of your yummy recipes. Thanks for helping me battle the bulge!!!! So happy you enjoyed, Barb! Hi!!! I am so excited to make this and was wondering if you had tried it in a crock pot? If so, how long did you let it go? Thank you!! I haven’t made it in the crockpot, but it should be okay! I’d let it go for maybe 4-5 hours. What does pp in the points section mean? I am currently on WW and follow the program now. 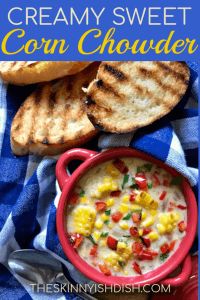 The corn chowder sounds delicious but need to know how to chart it. Thanks for the great recipes. It’s an older points system. If you’re following the current plan just track the Freestyle Points info. I hope you love it! Just made this last night and it is delicious! I didn’t have half and half so I used the 1% milk I did have. It is so yummy! The only thing I did differently was to use my immersion blender to cream some of the corn after cooking. This didn’t alter the taste at all, just the texture. I know I will be making this recipe a lot! Thanks for another great addition to my recipe box, Star!! So happy you hear you loved it, Dana! Can you freeze this soup? Just made it it was delicious! It should freeze well! So happy you love it! I love this recipe!! While I intended to have this on a chilly fall evening, it ended up being 85 degrees the day I made it. Even so, we loved every bite. I can’t wait to make it on a cold night. This is going to be my go-to winter soup! So happy to hear you enjoyed it, Hilary! The chilly evenings are coming so there will be plenty of time for this chowder on those nights.Haha! Do you peel the potatoes? Picture looks like they are but post and directions don’t have it.